Zika virus with sites of glycosylation in turquoise. Zika virus infects people around the globe. For most, the virus causes a mild illness that is quickly fought off by the immune system. But a connection between Zika infection in pregnant women and birth defects has underscored the need to find ways to fight the disease. Zika is spread by mosquitos, so our primary defense is to remove breeding sites and to take measures to avoid being bitten. 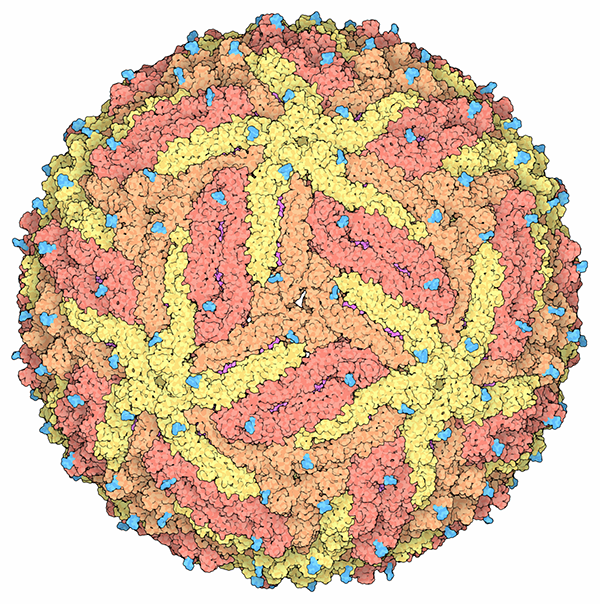 This image of Zika virus was created using the 3D structure from PDB entry 5ire, determined by cryo-electron microscopy. It shows that Zika virus is very similar to other flaviviruses such as dengue virus and West Nile virus. The structure includes the Zika virus envelope glycoproteins, which are found on the surface of the virus and are involved in attaching to cells. Inside, the virus also has a layer of membrane and the viral RNA genome associated with capsid proteins. This atomic-level structure will help researchers better understand how the virus enters human cells after mosquito-borne or sexual transmission. The structure also sets the stage for studying where neutralizing antibodies bind on the viral surface, which will in turn guide vaccine discovery and development. One entire antibody is shown schematically (upper right) This antibody was originally identified because it neutralizes dengue virus. Researchers subsequently found that it is also effective against Zika virus. Researchers are studying the binding of human antibodies to Zika virus with the goal of developing a vaccine to fight Zika infection. 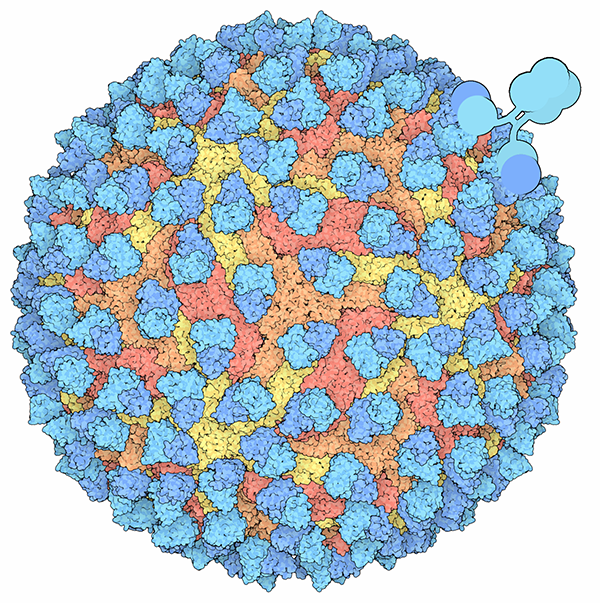 This structure (based on PDB entry 5h37), also determined by cryo-electron microscopy, includes the proteins that coat the surface of the virus, shown in yellow, orange and red, and many copies of the virus-binding portion of an antibody Fab, shown in blue. To build paper models of the Zika virus, download and print the template PDFs (Zika Virus/5ire and Zika Virus with antibodies/5h37). Cut out the structure along the dashed lines, and fold along the solid lines. 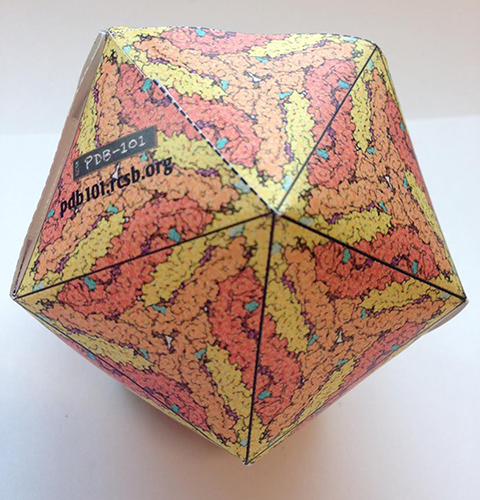 Then tape or glue the flaps into place to form the viral icosahedron. 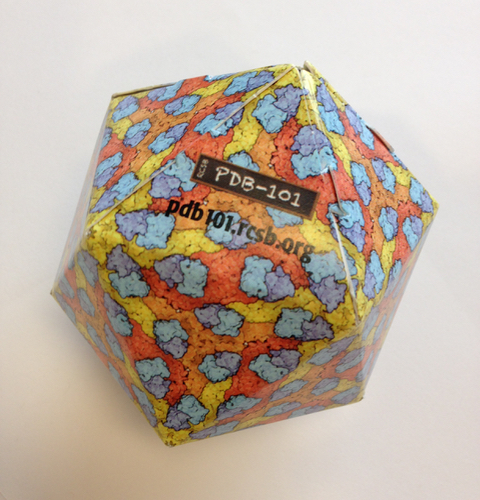 Use the PDB-101 Browser to explore more resources and articles about Zika and viruses.